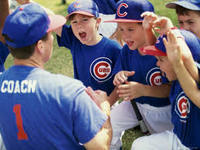 What Makes A Little League Coach A Success? With little league baseball season in full swing all over the country, I'm sure there are quite a few teams with managers who are taking charge of a team for the very first time. It's a tough gig that takes a LOT of time, patience, knowledge and a good temperament. If you've taken on the responsibility of managing a little league team, forget any overtime that you might be able to earn from your real job during baseball season. There's only so much time that the sun is up and most managers are trying to figure out how to cut out a little early to get to team practices and games - not stay later at their jobs. Managers not only need to be thoroughly familiar with every rule of the game, but they need to know how to teach the skills to their young ballplayers. Some kids are natural athletes and pick things up with little to no instruction at all. Other kids require a lot more time and effort. And of course, there are the parents. Every parent wants to see their kid play. Some are content to just see that their child is having a good time while others are adamant that their star-in-the-making get every minute of playing time the team is on the field - other players be damned! Dealing with the egos of young ball players is one thing; having to subject yourself to the ultra-competitive nature of some overbearing parents is another thing entirely. A couple of years ago, a fantastic article appeared on the Youth Baseball blog titled, " Baseball Goals for Coaches." It was written by Jim Bain after he retired from the active ranks of little league coaching and is a great reality check for new coaches and even ones who have been doing it for awhile. I consider it an absolute MUST-READ for anyone who coaches a little league team. In the article, Jim discusses several things that are part of the life of little league managers. He says that, although winning isn't everything, you should still be teaching your kids in such a way that it is the ultimate goal. In real life, winning IS everything - there aren't any good paychecks being handed out for just showing up (unless you are a congressman, that is). And besides, winning is fun! He says that you need to surround yourself with as many parents who are willing to help as you possibly can. There are many parents that are quite knowledgeable about baseball skills that simply don't have the time or commitment to take on the role of a manager. They can spare a few hours here and there, so you should take any minute that they can give you. Your job is not to be a glory-hog; it is to teach youngsters how to play the game - even if it means other coaches get to take some of the credit. If you teach your kids well, winning will be a natural result. Not only will they become better ballplayers, but they will learn that dedication and hard work DO pay off - something that will serve them well for the rest of their lives.